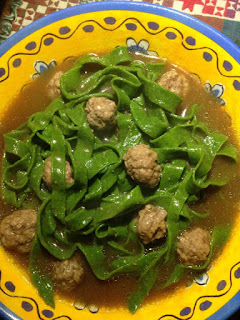 This is a broccoli rabe noodle with tiny meatballs in beef broth. The rabe is chopped, dehydrated, ground and then worked in 50-50 with flour and egg to bind. Rolled and cut by hand. The meatballs are just rolled and tossed in the pot, no seasoning, since the noodles are all fresh and green. 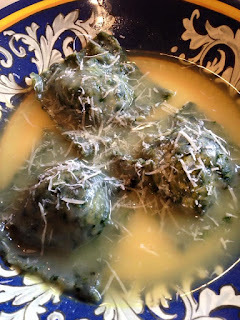 These are ravioli made with wild sow thistle harvested from my yard, rolled into pasta sheets, stuffed with ricotta and moistened with chicken broth. A little parm on top. I really thought they were dandelions, but was told otherwise. All the same very tasty. 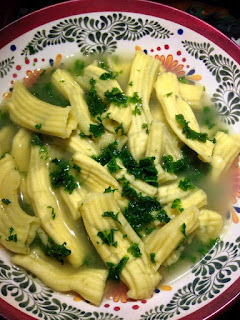 These are hand cranked rigatoni made from fresh yuca/cassava with some chopped kale. Very chewy and aromatic. And gluten free of course.